A 32- year - old Lagos tailor, Mr. Suleiman Ajenifuja, has been arrested with three suspected human skulls. 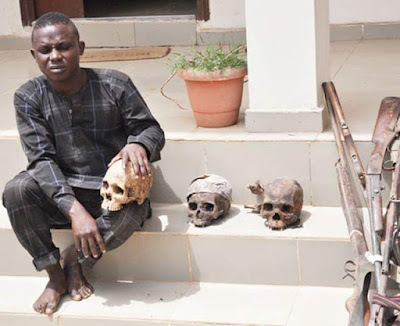 The father of two , who also claimed to be working as a street sweeper in Lagos , said he was taking the skulls to an Islamic cleric for spiritual purposes when he was arrested. He said he combined street sweeping with tailoring , adding that he wanted to use the skulls to make a ritual to draw more customers to his shop . Ajenifuja said a friend connected him to the Islamic cleric . He said , “I am a tailor, but I also work with the Lagos State Government as a street sweeper from 11pm to 2am. While I was working one night, I saw a bag containing these things (the skulls). I initially wanted to drop the bag, but someone told me that the skulls could be used for some things. “I contacted one of the boys that we usually talk together , named Saheed , and he gave me the Alfa ’ s phone number. When I called the Alfa, he told me to come to Ilorin. I have never been to Ilorin before, but he asked me to alight at a particular place where he would come to pick me. The Kwara State Commissioner of Police, Mr, Ado Lawan, who paraded Ajenifuja along with other criminal suspects in the state, said he was arrested on March 26 by operatives of the Federal Highway Patrol Team of the command, led by one Mr. Erumebekakhue Benson. He added that the team intercepted a commercial vehicle conveying seven passengers en route to Ilorin from Lagos. He said when the passengers were searched, three skulls wrapped in a sack were recovered from a black bag belonging to Ajenifuja. According to him, the suspect admitted to being the owner of the exhibits and claimed to be taking them to Ilorin from Lagos for ritual purposes. The CP said the suspect would be arraigned after investigation . He noted that the command had, during the ongoing mop up of arms, recovered 51 firearms from members of the public who responded to the directive of the Inspector -General of Police, Mr. Ibrahim Idris, for them to surrender all unauthorised firearms . He said the firearms willingly submitted included 32 single-barrelled guns, four locally-made cut-to-size single-barrelled rifles, eight locally-made single-barrelled guns, three cut- to - size double -barrelled guns and one AK - 47 rifle. Others are one double -barrelled gun, one English pistol, and one locally-made single-barrelled pistol with two cartridges. Ado said, “The Kwara State Police Command wishes to inform the public that the enforcement of the mop up and recovery of illegal and prohibited firearms still in possession of such individuals is ongoing. “Anyone who fails to voluntarily surrender them will be arrested and prosecuted . “We wish also to inform members of the public of the extension of the date of withdrawal of all police personnel attached to very important persons, government officials, corporate organisations, political office holders, has been extended to April 20, 2018.